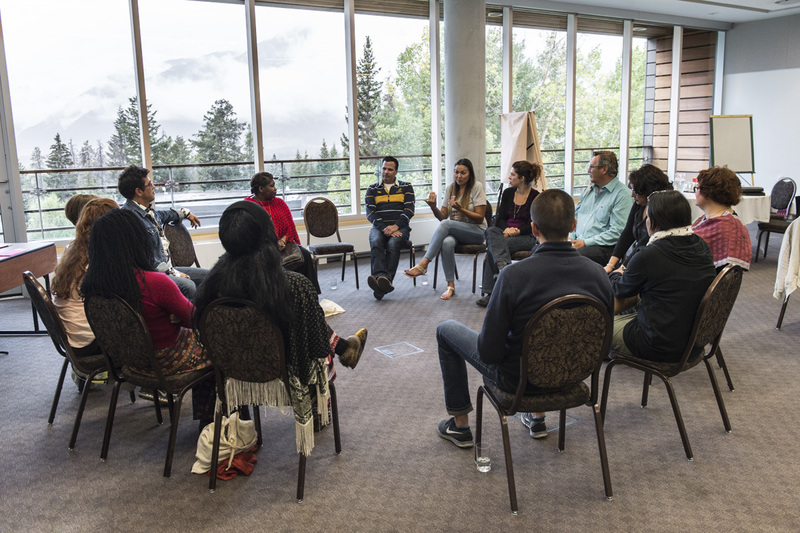 Cultures-Based Innovation Symposium participants in discussion at Banff Centre for Arts and Creativity. Carol Anne Hilton is the first member of her family in three generations who didn’t attend a residential school. Raised in foster care with her brother and separated from her two oldest siblings, her traditional name is Wakatush (“Big Sister”), continuing a long line of eldest daughters in her ancestry to hold a name which gives influence in the community. 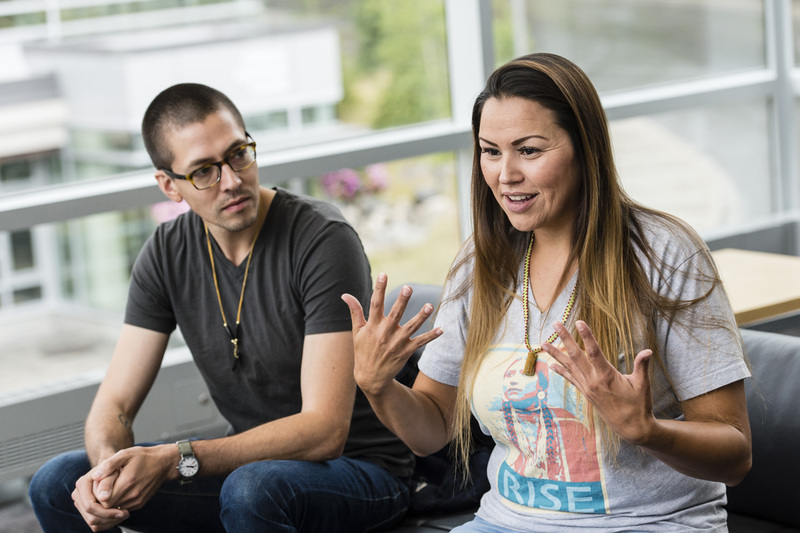 Standing at the front of a conference room, this is how Hilton introduces herself to fourteen other cultural innovators — people who use traditional knowledge to inform innovative design, research, and business practice. In addition to finding a job that day, Hilton found her family. After working in the store for a few weeks, she and the store owner discovered a connection; it turned out that she was Hilton’s biological aunt, and became the link to reconnecting with her family from whom she had been separated many years before. Only after sharing her personal story does Hilton go on to tell the group about her business practice and share examples of her work. As she describes her mandate to increase options for First Nations people and communities, it becomes clear how the thread of her past is woven through her work today. In sharing her personal stories, she was able to connect others more clearly to the heart of her work. 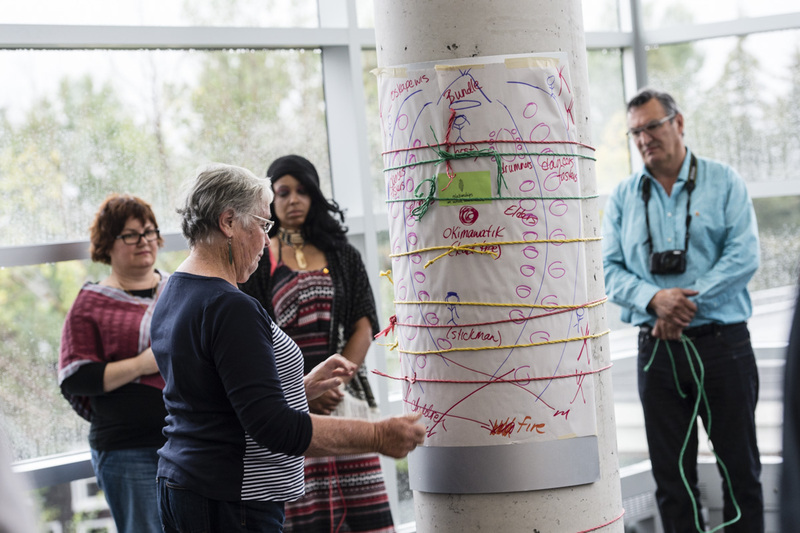 Over the five days of the Cultures-Based Innovation Symposium, fifteen designers, anthropologists, innovation consultants, and Indigenous activists each took time to share their personal stories and backgrounds, before they went on to present their work. The participants, who hailed from across the Americas (Chile, Canada, Brazil, Jamaica, Mexico, and USA), also went on group field trips, lingered over meals together, and, above all, spent time getting to know one another. Elizabeth (Dori) Tunstall, founder and director of the Cultures-Based Innovation Initiative, wonders why so many conferences are based solely on the principle of sharing ideas instead of deepening relationships among the participants. She says the intention of the Cultures-Based Innovation Symposium is to break down the focus of other conferences that are centered exclusively on the work, and not who you are as an individual. Instead of the typical two minute conference introduction in which presenters report their geographical base, their job title, and a laundry-list of accomplishments, Tunstall suggests that sharing a profound background of yourself creates an intimacy among the participants, allowing them to collaborate deeply once the conference comes to an end. Even though people came from such diverse backgrounds and work in totally different fields, at the end you could see a common weaving theme around what people did and how they applied their humanity to their work. I thought that was really powerful. How does Tunstall know this connection has occurred? She explains how one member of the original symposium passed away a couple of weeks ago and fellow participants sent messages of love and fond memories, sharing how special he was. 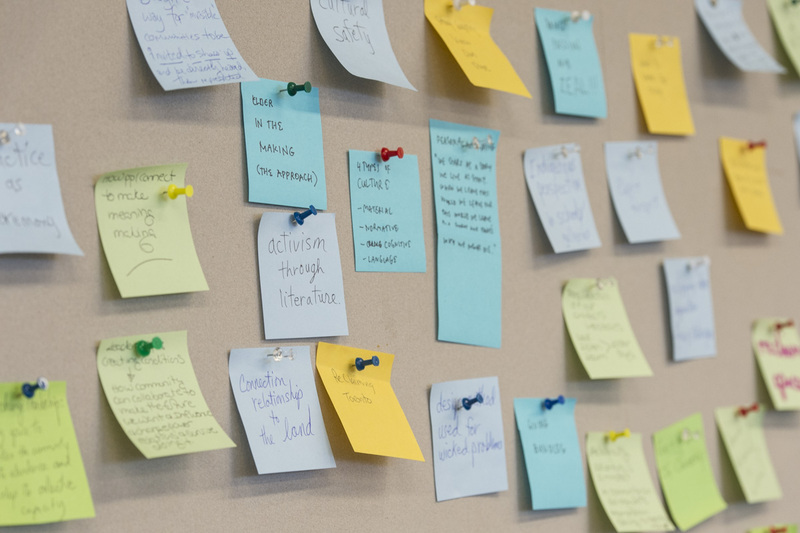 Even participants who attended a different symposium — people who had never met the man, but were connected through the network — shared messages and reached out to support those who had worked with the researcher. So what makes Cultures-Based Innovation the perfect field to try this experimental relationship-based conference structure? 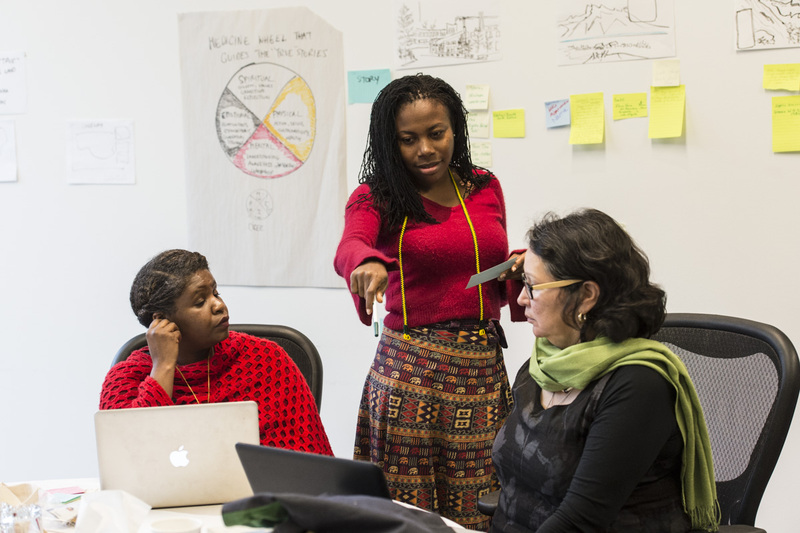 The goal of the symposium is to expand the global network of scholars/practitioners with an interest in Cultures-Based Innovation, defined as a set of innovation methodologies that use traditional ways of knowing to drive transformative innovations that directly benefit communities of high cultural wellness, yet who may experience social and economic distress. In their extended introductions, more than one presenter remarked, “In my work, I feel so lonely.” As participants tell the stories of their backgrounds, a theme emerges: these are people who moved a lot during their childhood, many to different countries where they had to learn to speak a new language as they adjusted to a new home. 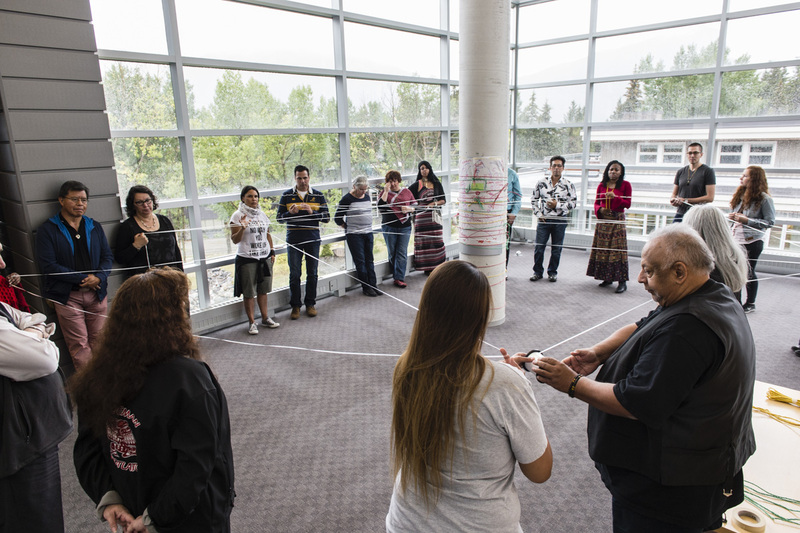 Even the participants who didn’t move around during their childhoods had their own unique upbringing; the majority of the Canadian fellows grew up on a reserve where their own parents had been displaced to residential schools. Hilton says that although participants were confused by the open-ended model at first, they left Banff understanding the benefit of hearing personal stories — the deeper your knowledge of the person, the more you can understand the work.